7.The Deputy Registrar (Budget & Accounts). Sub: Availability of option for fixation of pay on MACPS from the date of next increment (DNl) in the lower post and method of fixation of pay from DNl, it opted for, in context of RS(RP) Rules, 2016-regarding. Further to the above, DOP&T, vide their OM dated 20-9-2018 (copy enclosed) has now conveyed a decision, taken in consultation with Department of Expenditure that the aforesaid DOP&T’s OMs dated 27-7-2017 and 28-8-2018 (adopted vide Board’s letter dated 31-7-2017 and 20-9-2018 respectively) are also applicable in the cases of pay fixation after grant of financial upgradation under MACPS. The said DOP&T’s OM dated 20-92018 will be applicable mutatis mutandis on the Railways also with reference to RS(RP) Rules, 2016. 4, This issues with the concurrence of the Finance Directorate of the Ministry of Railways. 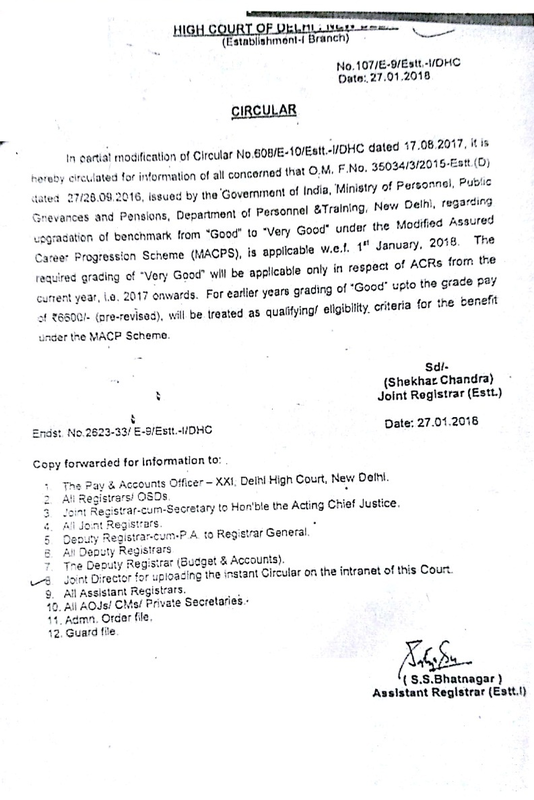 I am directed to say that as per extant instructions,non functional Grade pay of Rs.5400 in PB-2 (per-revised) is granted to those Superitendents/ Appraisers who have completed 4 years who was granted Grade pay of Rs. 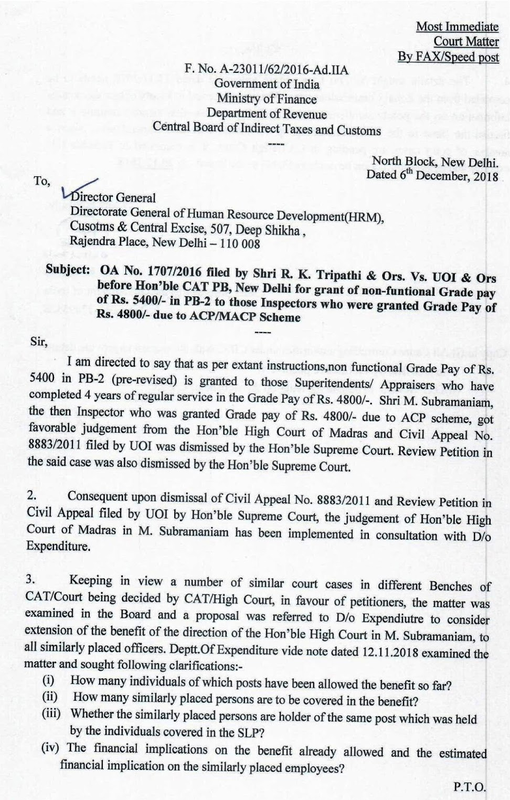 4800/- Shri M.Subramaniam,the then Inspector who was granted Grade pay of Rs. 4800/-due to ACP scheme, got favorable judgment from the Hon’ble Supreme Court.Review Petition in the said case was also dismissed by the Hon’ble Supreme Court. 2.Consequent upon dismissal of Civil Appeal No.8883/2011 and Review Petition in Civil Appeal filed by UOI by Hon’ble Supreme Court,the judgement of Hon’ble High Court of Madras in M. Subramaniam has been implemented in consultation with D/o Expenditure. (i) How many individuals of which posts have been allowed the benefit so far? (ii) How many similarly placed persons are to be covered in the benefit? (iii) Whether the similarly placed persons are holder of the same post which was held by the individuals covered in the SLP? (iv) The financial implications on the benefit already allowed and the estimated fiancial implication on the similarly placed employees? 4.The details sought by D/o Expenditure vide note dated 12.11.2108 needs to be compiled from the Zonal Commissionerates. 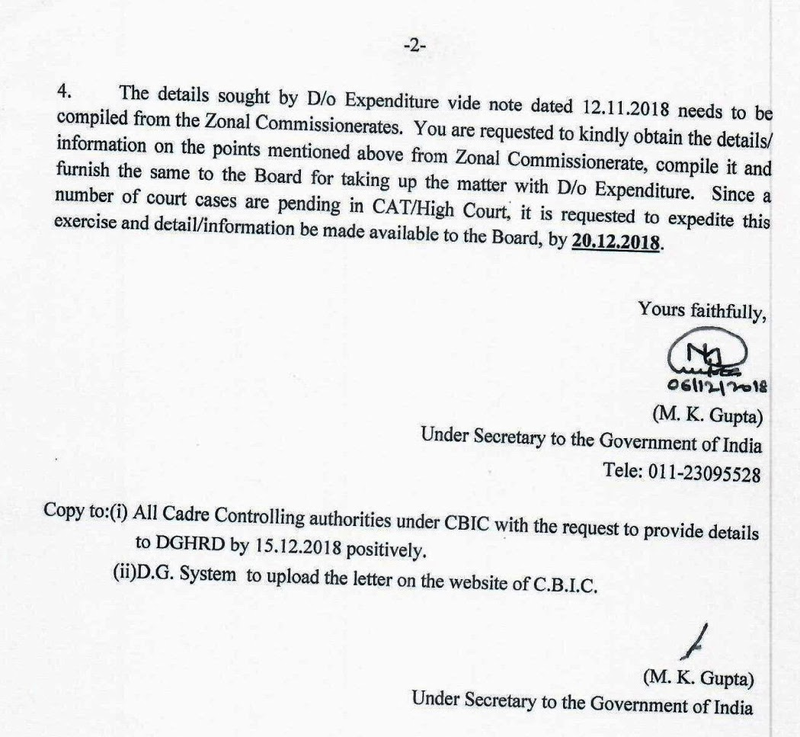 You are requested to kindly obtain the details/information on the points mentioned above from Zonal Commissionerate, compile it and furnigh the same to the Board for taking up the matter with D/o Expenditure. Since a number of court cases are pending in CAT/High Court, it is requested to expedite this exercise and detail/information be made available to the Board, by 20.12.2018. This OA is filed with a prayer to direct the respondents to revise the pre-revised scale of pay of the applicants to the one Rs.7500 to 12000 instead of Rs.7450 to 11500 w.e.f. 01.01.2006. They seek further direction to upgrade the post held by them to the one of Accounts Officer/Audit Officer in the scale of Rs.5400 in PB-2 instead of Rs.4800/- and for further revision of pay scales. (a) The impugned judgement and order dated 16th April, 2013 made by the CAT is hereby set aside. Subject: – Discrimination in granting Grade Pay on Grant of Financial Benefits under M.A.C.P. – Violation of Government Order and judicial Verdicts. On behalf of members of this Association I am to submit herewith following facts for your kind consideration and early favorable action. Filled in by Direct Recruitment or by Promotion from L.D.C. The Tribunal has granted the Grade Pay of Rs. 4800/- on grant of lst Financial Benefit under M.A.C.P. from Rs. 4200/-. We do not understand the logic of the Ministry of Defence, D.O.P & T. Ministry of Finance or even the Ministry of Law as to how the aforesaid directions as upheld by Hon’ble High Court of Delhi and the Apex Court cannot be made applicable to the Applicants who are admittedly similarly placed. In our considered opinion the Respondents/Departments should desist from rejecting the genuine request of the employees and force them to knock the door of Courts unnecessarily without any justifiable grounds. In view of above observation of Hon’ble Principal Bench I request you to consider our request positively and arrange to do justice by removing the discrimination between the two set of similarly situated employees.